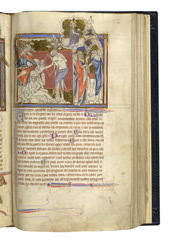 This Apocalypse manuscript contains the Latin text of the biblical book of Revelation, written on versos, with a commentary in French on the facing rectos, each with a miniature. The manuscript takes its name from two added inscriptions: one states that it was given to the Benedictine abbey of St. Mary, Abingdon, by a bishop of Salisbury; the other records that it was lent by the abbot and convent of Abingdon in 1362 to Joan, wife of King David II of Scotland. The King at the left is directing the martyrdom of St. Lawrence (being grilled) and St. Edmund (tied to a tree and shot with arrows). If this manuscript was always intended for Abingdon, St. Edmund (of East Anglia) may have been included because he is the namesake of St. Edmund of Abingdon (d.1240).